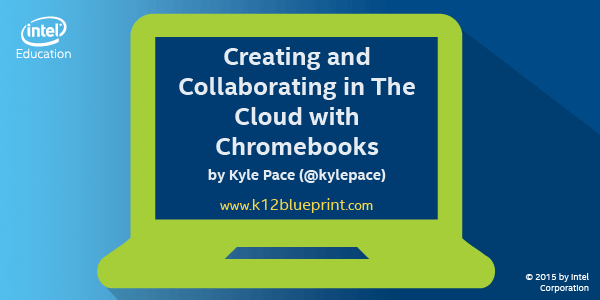 This is a guest post that is cross-posted on the K12 Blueprint Blog by @IntelK12EDU. Our world is online now – we bank, shop, socialize, and work in the cloud. Chromebooks are made for this. They give us a secure, well performing portal to the world. 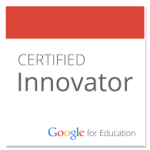 If your school district is already using Google Apps for Education, the integration of Chromebooks is seamless. Isn’t this what we want for technology to become in school – practically invisible and as commonplace as pencil and paper? One of the best things about Chromebooks/Google Apps for Education I’ve said for a long time is that they do a great job at getting out of the way of student learning. We now have our Gmail, Google Calendar, Google Keep, Google Drive, and any other favorite web based right at our fingertips across all types of devices. We (teachers and students) no longer have to be bound by just one operating system or type of device. Schools must begin leveraging these tools to bring students into the world of working in the cloud, communicating, collaborating, and creating on the web. We can’t afford not to give our students this type of access – at school and at home. Don’t leave it up to high school, college, or the workplace to give our students their first experience of working in the cloud. Students of all ages can access loads of grade-level appropriate content on a Chromebook. The Chrome Webstore has an entire section of educational apps or you can head over to Google Play for Education where teachers and parents can find educational apps for Chromebooks that have all already been vetted by teachers. Google Play for Education is a great spot for teachers to go too if they want to send an app to their entire class easily. I remember this debate well when Chromebooks were first making their entrance into K-12 education – students can’t create anything when you can’t even install software on a Chromebook. Or another – they become a paperweight if you’re not connected to the web. Neither of these claims are true. Software that once had to be installed via a CD-Rom (remember those?) is now accessible via the web and can be used via Chrome the same way it would if it were installed on a more traditional platform. Students can create and edit video projects, edit photos, build 3d models and print them, publish presentations, code, and create music all from their Chromebook. Google has done a great job at making it easy to work on Google Drive files and Gmail even if you’re without an internet connection. While you’re connected to the web, you go into your Drive settings, check a box, and bang you’re done – you’re able to edit Docs, Sheets, and Slides files offline. Next time you’re connected everything gets back in sync with the cloud. Whether a school has ten or ten thousand, Chromebooks can be managed easily from a web-based console. From an instructional standpoint one of the best things we did for our elementary students was push out a standard set of apps to students in each grade level via the management dashboard. It gave a “standard load” of educational apps and tools to each student in each grade. Students could still of course add any other apps they or their teacher wanted. The Google Apps dashboard also allows for security measures and other important settings to be in place across all devices (or just for particular groups of students and staff) without having to physically touch a single Chromebook. More and more big name tech giants are producing their own line of Chromebooks. When the Chromebook initially came out they might not have been up to par on the technical side, however, they can now be found with specs that rival other competitors. Once Chromebooks came out with Intel processors and other powerful features, it significantly changed the game for personal computing because you can get a powerful device much more affordably. The New York Times even posted an article recently about how Chromebooks are gaining significantly in education over other platforms. 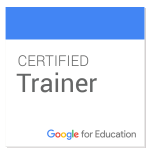 I stand by what I said earlier, if you’re in a school or a district that already uses Google Apps for Education, then the Chromebook is your device. If you’re in a place where your school is trying to make a decision of one device over another my biggest advice is to take your time making this very important decision. When my district did this one of the most beneficial things we did was listen to our students; ask them what they wanted in a device. Make the time to do this. Reach out to other educators on social media because there are loads of fantastic people that have paved the road for you and they’re willing to share best practices. 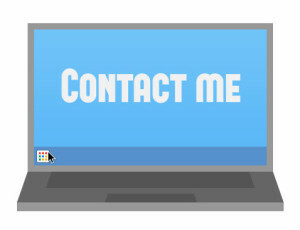 Or send an email to a neighboring district to set up a meeting or a Google Hangout to ask questions and engage in conversation. One of the best by-products of technology is its ability to connect us to other brilliant people. We’re truly better together.